Please choose the currency and then click the button, which will open up a new window to confirm your donation. Also, if you're looking for something else to use up plums then why not try this Traditional Plum and Lavender Jam recipe (click here) and our very Old School Plum Chutney recipe (click here) as they both make delicious gifts that you won't find in modern recipe books or shops. This couldn't be simpler, you just need plums, brandy (or rum) and brown sugar. That's it! This isn't difficult - so don't worry if you're not a cook! 1. Pick then wash the plums, then cut them in half and twist out the stones. You can use a plum stoner but it's prettier if you do it by hand as you can see the neatly sliced plums through the sides of the Kilner jars when you have bottled them. 2. Now it's time to lay up your plums in the Kilner jar. Lay a layer of plums then a generous quantity of brown sugar to cover them, then another layer of plums and so on until the jar is full. 3. Now add the brandy or rum to cover the all the fruit. If you're making Rumtopf it will ferment so make sure that there is a decent air space at the top of the jar or you'll have brandy everywhere when it does. If you're making plum brandy, cover all the plums well in brandy before sealing the lid. 4. That's it - put the jars to one side for 3 months. Then either give them away with the following instructions or drink them yourself. After 3 months remove the fruit and then strain the liquid through a muslin or net curtain off-cut to get the plum brandy. The fruit is excellent for puddings and traditionally is served on it's own with cream at Christmas if you've made a Rumtopf (and yes the top layer of fruit will be black due to oxidation - don't worry it tastes as good!). Christmas Rumtopf and Plum Brandy - a great present! Origin Coffee Oatmeal Stout Recipe - easy brew! 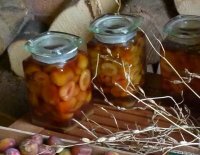 Old English Plum Brandy Recipe - One for Xmas! How to make Cider - From orchard apples to bottle. How to make Perry (Pear Cider) - From scratch. DIY Scratter (Fruit Pulper) - for cider & perry. 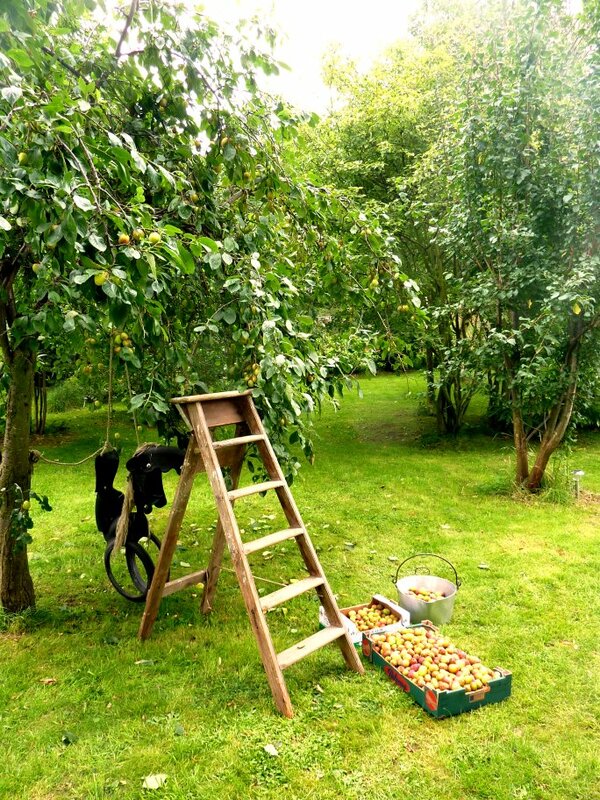 DIY Cider Press - Easy and effective plans. Home Brewing Tips & Tricks - Brew better. Lavender Beer Recipe - old school style. 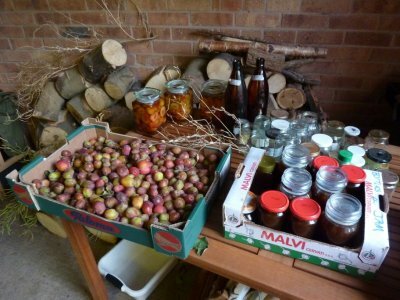 How to make Plum Brandy - A seasonal xmas treat. How to make Traditional Plum Chutney - delicious! Old English Plum & Lavender Jam Recipe - so good. How to make Bacon - Smoked or unsmoked. Roast Meat Calculator - timings with one click! Check list for getting through the MOT - never fail again. Voodoo QX micro slope glider plans - DIY fun! How to fit & shape a DLG throwing blade - get it right! Make a simple epoxy/filler injector - so useful! DIY portable Wind Tunnel - set DLG tails accurately! How to accurately mark a boom's centre line. Flying Pterosaur Plans - RC foam dinosaur. Firefly DLG build notes - Construction guide & tips. Toolpac CAMPAC backup software - download here! DIY Universal Futaba Service Menu Enabler. Futaba 9Z Unofficial Service Manual - download here! Futaba 9V Unofficial Service Manual - download here! If we helped save you money, please pay the favour forward and help support the upkeep of this site and its guides for others. Just click a button below. Big thanks from us for your help! Many people have already helped others through this site by contributing information and techniques. If you have something you want to contribute, please click here to contact us. You'll be credited on this site and you'll have shared what you know to help the community.